The University of York (UK) invited the “Atari Burial Ground” archaeologists to speak via Skype at the recent conference, Digital Heritage Meets Interactive Storytelling. Bill Caraher and I were able to do the call, and you can click HERE to listen/download the 67MB MP3 (which is an hour-and-a-quarter long). 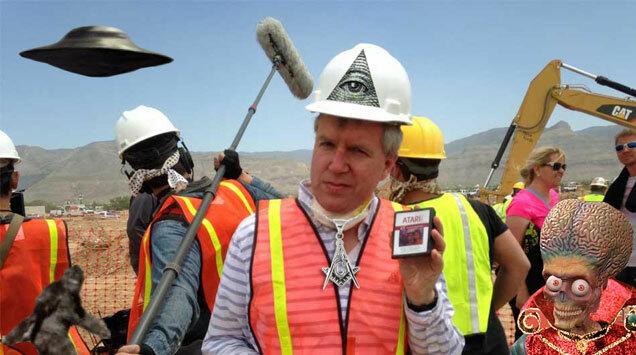 Because the conference dealt with narratives, Bill and I talked about all of the different stories embodied by the Atari excavation in Alamogordo, New Mexico in April 2014. How many layers of narrative were there, who were sharing these stories, and why? The talk is less about the archaeology itself, and more about how reality becomes myth and back again, and how the archaeologists, media, and public communicated what happened at the game-burial and eventual recovery and sale of the cartridges. Bill and I would like to thank the DHIS organizers Romana Turina and Tara Copplestone for inviting us to speak. We enjoyed it, and hope the conference delegates in York did, too. I enjoyed this podcast very much, thank you for making it. He claims the product was not end-user returns to the store but rather store returns of unsold product to Atari. To what extent do your findings support this claim? Also, did the production crew know there would be games from the ecological survey conducted a decade prior or did they have some other undisclosed prior knowledge? Thanks for the comment. I didn’t learn that Heller was on-site until after we’d all returned home after the excavation. The archaeological team (me, Richard, Bill, and Raiford) were kept busy and relatively contained by the film crew and the NM state safety guys, so we had little interaction with what was happening outside the fence. As for the dumped product, I would say that yes, some (many?) of these games were likely store returns of unsold product. We found cardboard boxes containing six copies of a game. We also found blisterpacked games with price stickers from Target and and other retail shops. One game had a return sticker on it with a person’s name and address in New Jersey. There were a lot of loose boxes and loose cartridges in the ca. 1,300 games recovered. I think it was no secret that the games were in the landfill based on the newspaper articles from the 1983 New York Times and Alamogordo Daily News, plus the memory of the citizens of the city of Alamogordo who visited the landfill during the dumping, plus Joe L. Joe’s years of archaeometrical theorizing paid off in a big way by pinpointing the cell in which we dug. Also, I am not an academic, but I would think a book of your findings framed as the unearthing of narratives (as your podcast was) would make a fine format. Thanks! The archaeologists are writing a non-academic book now. We’re also finishing a technical article, and once that’s published, we’ll make all of our data, images, video, etc., available to anyone who wants it for free.